Jeffrey C. Goldberg is a member of the firm’s Executive Committee. Mr. Goldberg concentrates his practice in real estate law, finance and corporate, with a special focus on family offices and entrepreneurs. In his real estate practice, he represents a range of clients including owners, investors, tenants, and lenders in a variety of commercial, financial and real estate transactions. His experience included advising on contracts, partnerships and project dispositions as well as representation in real-estate-secured financing. In his finance and corporate law practice, he represents a wide variety of corporations and financial investors as well as entrepreneurs and owners of small- and medium-sized businesses. He provides legal assistance in corporate finance transactions, both domestic and international, including acquisitions, private placements, joint ventures, employment, and financing. Mr. Goldberg’s business and corporate background allow him to serve as general counsel to numerous family offices. 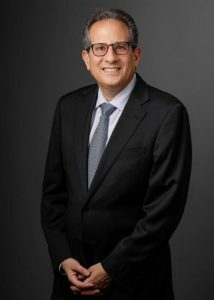 He provides advice regarding business and real estate acquisitions and divestitures, private equity investments, venture capital investments and other transactions involving the family enterprise. Prior to joining Sadis & Goldberg, Mr. Goldberg was an associate at Milbank, Tweed, and Hadley & McCloy LLP.